How Is Your Diet Going? I only ask because, well, you know: Diets don’t work. If you’re on a diet right now (“Diet” being defined in this case as an intentional restriction of eating in order to reduce weight), you’ve probably been on a diet before. Many studies have reported that upwards of 80% of dieters regain the weight they lost (or more) within five years, likely caused by decreased metabolism and increased appetite resulting from dieting. Many people then try to lose again. And then they gain. And then lose. I’ve done my share of dieting and “it’s not a diet, it’s a lifestyle”-ing. I’m a Lifetime Member of Weight Watchers, which works for me- as an emotional eater- to set parameters around my eating habits and to opt for healthier choices. Weight Watchers has changed a lot since my first go-’round in the ’80s, and incorporates all aspects of health including activity, social life, mindfulness and more. I don’t even consider it a diet. It doesn’t feel restrictive, and no one would even know I follow the plan if I didn’t tell them, because I eat plenty and enjoy all the things I love (pizza and beer, I’m talking to YOU). But, to be real, it’s still a “diet.” I still think about what I will eat and cautiously plan around “high-point” foods, so that I don’t overeat and gain weight. I’m not having dry tuna and lettuce for lunch, ever. But I’m also not eating foods or quantities based solely on my desires; I definitely track and plan and limit portions. I rationalize this by saying that my body’s cues are haywire; that years of endocrine issues, yo-yo dieting and emotional eating have made it hard for me to truly tune in to what my body needs at a given point. Weight Watchers gives me training wheels. While this is working for me currently, I am having doubts about the long-term viability of following any “eating plan” or diet. Even the “it’s not a diet, it’s a lifestyle” approaches. Do I have to track and plan for the rest of my life? As a certified Holistic Health Coach and a former eating disorder professional, I am theoretically opposed to diets. Theoretically, I have always believed that diets fuel self-loathing and can be self-injurious in nature. As a women’s issues leader, in theory I believe that diets can be a pervasive form of our culture’s misogyny, body-shaming women into smallness and self-doubt. And then I just believe that I feel uncomfortable in my own skin and have abandoned my self-care efforts and need to prioritize my health. My endocrinologist recommends my current weight range because the symptoms of my PCOS and hypothyroidism are both exacerbated by excess weight. My health markers- cholesterol, blood pressure, and so on- are all fine at a higher weight, but I want to feel good, too. Which is fair, right? We want to take care of ourselves and we want to feel comfortable in our bodies. We want ease of movement, we want to keep up with the kids, we want to freely try new activities and feel energetic. We want to be healthy! Research now suggests that being overweight doesn’t have the negative health consequences we once thought it did, but that perhaps some lifestyle habits that are inversely correlated with obesity may describe the link. More and more research is finding that weight, in and of itself, is not correlated with risk of premature mortality. Weight, in and of itself, may not cause the health concerns we all fear. When comparing groups of normal weight, overweight, and obese people, these findings from Methson, King and Everett, report that those who incorporated four healthy lifestyle habits consistently (eating fruits and vegetables, exercising three times per week, not smoking and moderate consumption of alcohol), had the same risk of death regardless of weight. In each weight group, those who incorporated all four healthy habits had lower risk of death than normal weight people who practiced three of those healthy habits! In other words, an obese individual practicing all 4 healthy habits has a lower risk of death than a normal weight person who practices 3. The attempt at losing weight itself seems to create a neurological backfire that triggers future binges and weight restoration. You may have heard about “starvation mode,” where the body holds onto weight in the face of caloric deprivation. But neuroscientist Sandra Aamodt has synthesized a body of research that indicates that your brain actually begins to counteract weight loss measures from the moment you set the intention to lose weight. This primal mechanism is a function of the hypothalamus, and is a biological imperative to promote survival. Your body is hard-wired to retain weight. What’s more, we each have a “set point” weight range that our brain accepts as viable for survival. Attempts to dip below that set point range will be met with resistance. Metabolism slows down. Appetite rages. Cortisol production spikes. And when you re-gain the lost weight, you’re inclined to gain beyond your original starting point. If this has been your process for years, your set point range is creeping higher with each gain. So… what’s a plump person to do? Get Real About Your Weight- Is your weight truly a problem? Is it causing physical symptoms or medical concerns? Does it have a regular impact on your social/emotional life? And by this I mean, are you unable to participate in routine activities because of your weight? If your daily life isn’t negatively impacted by extra weight, you might want to reconsider your weight loss goal. Discuss it with your physician and your therapist before making any decisions (author Anne Lamott posts a perennial Facebook message that relays a story of the time she told her therapist she was going to start a diet, to which her therapist replied, “Oh, that’s great, honey. How much are you hoping to gain?” Wise woman). Take a Look at Your Primary Food– As a student at The Institute for Integrative Nutrition in 2006, I learned about the concept of “Primary Food.” Primary Food is the non-edible sustenance we need to thrive in life- relationships, spiritual practice, creativity, work, nature, physical activity and so on. By enhancing your primary food, you become more satisfied in life, you increase your body awareness, and you reduce the inclination to eat outside of your body’s natural hunger cues. 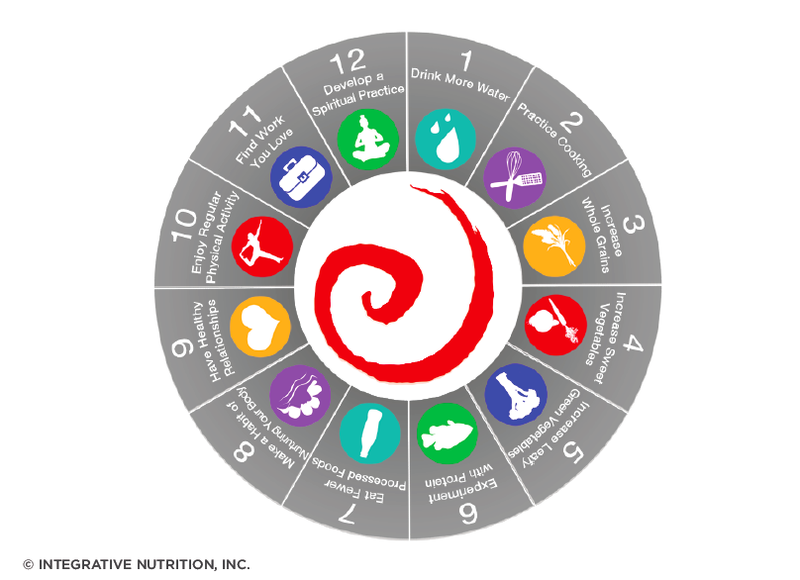 IIN’s 12 Steps to Better Health depicts the nutrition and non-edible components of holistic health. For those eat out of boredom, stress or other emotional triggers, focusing on improving your primary food can reduce some of those triggers and minimize overeating without dieting. Focus on the Four Habits– Eat fruits and vegetables daily. Don’t smoke. Exercise 3 times a week. Drink in moderation. If you do, your health markers will improve and your risk of premature death will be lower, regardless of weight. Practice Mindful Eating– According to The Center for Mindful Eating, “Mindful Eating is allowing yourself to become aware of the positive and nurturing opportunities that are available through food selection and preparation by respecting your own inner wisdom.” Through this process, you will learn to pay attention to your experience of each food in the moment, and become more aware of your body’s reaction, with less interference from your mind’s judgment. That might mean enjoying rice and beans for three meals in a row, and then eating half a steak for breakfast the next day. Experiencing your enjoyment of the food, noticing your hunger and fullness cues, and attending to your body’s reaction to those foods can help you nourish your body in a natural way without rules or judgment. This practice automatically removes that “diet” trigger from your brain, as you eat when you’re hungry, stop when you’re full and don’t take in any foods that you have an aversion to simply because they are “healthy.” Good news, right? No more dry tuna on lettuce. I can’t possibly even begin to touch on the importance of media literacy and monitoring your reactions to and internalization of the myriad messages and images we get daily that tell us our bodies aren’t right. Perhaps in another post. If you’ve commenced a New Year’s diet, please consider shifting gears so that you enhance and include the above recommendations rather than restrict and eliminate foods from your life. There is so much more to discuss here, and I’d enjoy a dialogue in the comments. Dissenting views welcome; please use respectful language. Author Angela Dora MarchesaniPosted on January 4, 2018 January 2, 2018 Tags Diet, health, resolutions, weightLeave a comment on How Is Your Diet Going?